The historical background to Sociology. 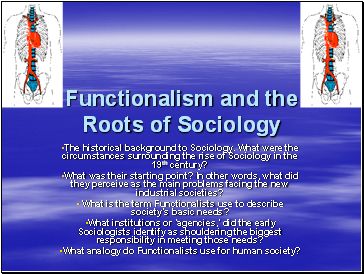 What were the circumstances surrounding the rise of Sociology in the 19th century? What was their starting point? In other words, what did they perceive as the main problems facing the new industrial societies? 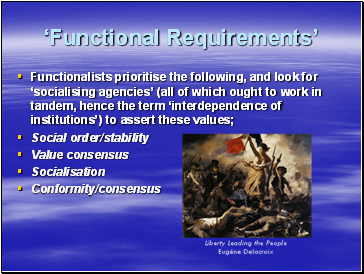 What is the term Functionalists use to describe society’s basic needs? What institutions or ‘agencies,’ did the early Sociologists identify as shouldering the biggest responsibility in meeting those needs? 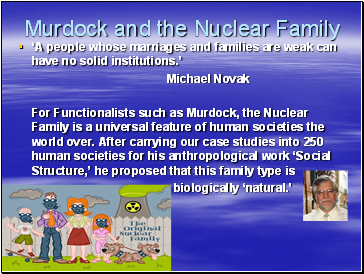 What analogy do Functionalists use for human society? 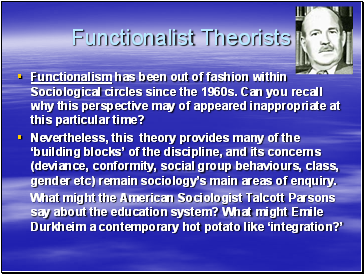 Functionalism has been out of fashion within Sociological circles since the 1960s. Can you recall why this perspective may of appeared inappropriate at this particular time? Nevertheless, this theory provides many of the ‘building blocks’ of the discipline, and its concerns (deviance, conformity, social group behaviours, class, gender etc) remain sociology’s main areas of enquiry. 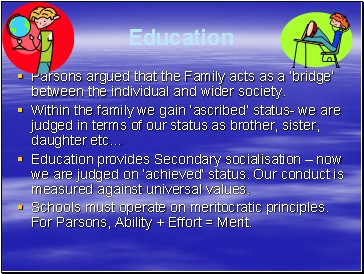 Parsons argued that the Family acts as a ‘bridge’ between the individual and wider society. Education provides Secondary socialisation – now we are judged on ‘achieved’ status. Our conduct is measured against universal values. Schools must operate on meritocratic principles. 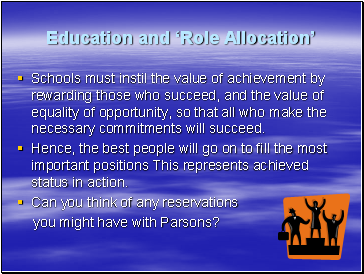 For Parsons, Ability + Effort = Merit.